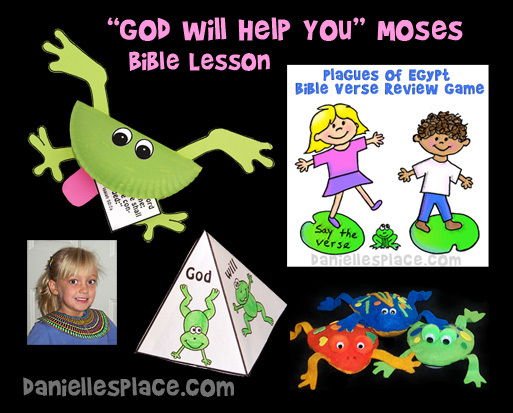 Children learn about Moses and the plagues of Egypt in "God Will Help You". 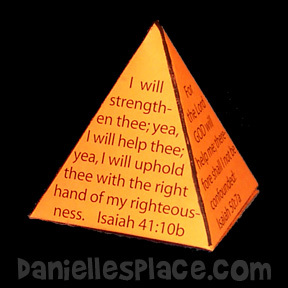 They learn that God helped the Israelites escape from Egypt and he will help them. 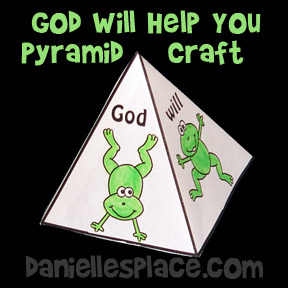 Using a frog theme, children can make a paper plate frog that hold's the memory verse in its mouth, a rock frog on a paper plate lily pad, or a Bible verse pyramid. 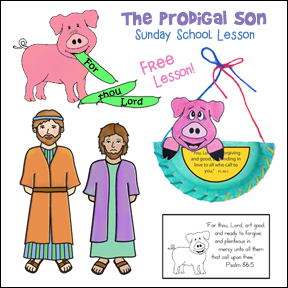 They play "Pass the Frog" bean bag game, a musical chairs lily pad game, or find out what the Bible verse is by taking things out of Froggy's mouth. They will be amazed at the things Froggy has eaten, besides the words to the Bible verse. Patterns include four full-page frogs in both black and white and color. 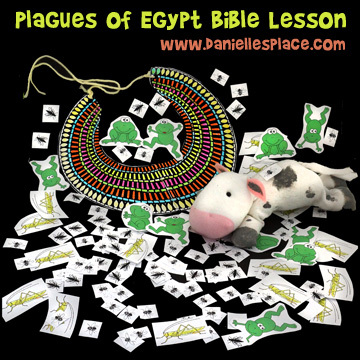 "God Will Help You" - "The Plagues of Egypt"
In this lesson "God Will Help You" your children pretend they are Egyptians or Israelites. 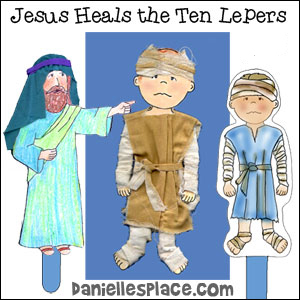 They "experience" some of the same plagues the Egyptians and Israelites experienced and learn how God showed his power and helped the Israelites escape from Egypt. 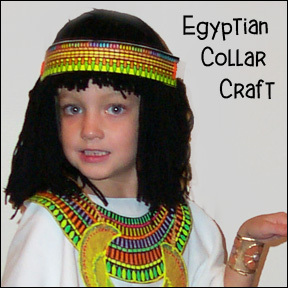 They color paper Egyptian beaded collars to be used by the Egyptians during the interactive lesson. The teacher uses paper gnats, grasshoppers, and flies during the lesson to reenact the plagues. 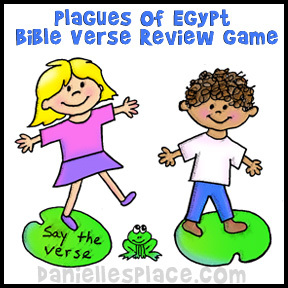 They play Bible Verse Leap Frog to study the Bible verse. The collars are called wesekh. If a child does not want to make a collar, don't force him to make one. Tell him if he doesn't want to make one, he can be an Israelite during the lesson instead of an Egyptian. Explain that in Bible times both Egyptian men and women wore jewelry - earrings, armlets, pendants, and necklaces and beaded collars. 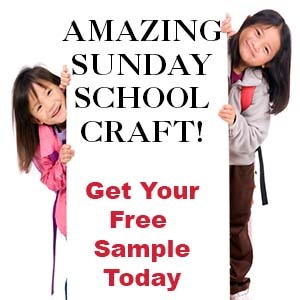 When a child is finished coloring, tape a piece of yarn to each end of the collar and tie the collar around their neck. Tell the children that they are going to pretend to be Egyptians during the lesson. Children glue fun foam shapes on to felt beanbags. 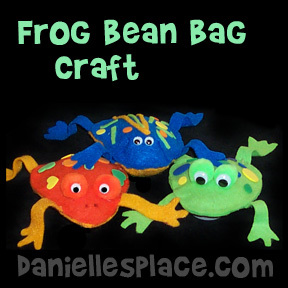 Make the frog beanbags before class. They are very cheap and easy to make. 1. Print out the pattern for the body and legs and cut them out. Use them to cut the shapes from felt. 2. Glue the legs and arms to one of the body shapes as shown in the picture. Glue the other body piece on top of the piece with the legs and arms attached. Leave an opening at the back of the frog. 3. Fill the body with bean, rice, popcorn, or fiberfill. Glue the body closed. 4. You can glue googly eyes to pompoms and then glue the pompoms onto the frog or just glue googly eyes onto the frog without using the pompoms. 5. Decorate the frog with fun foam shapes, beads, pieces of cut up felt, buttons, or anything else you can find. Let My People Go! With rhyming text and cartoon images, "Let My People Go!" 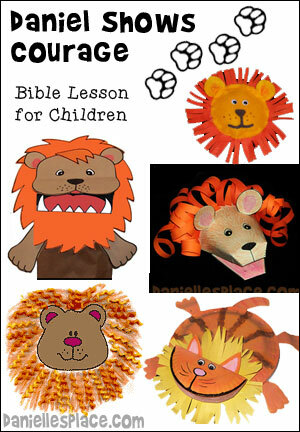 will entertain and teach preschool children the basics. Hey God, I'm Having an Awful Vacation in Egypt Thanks to Moses! Including a parents page and online app. You can keep playing this way or have the child that said the verse stand in the middle of the circle. Keep playing until most of the children are in the middle of the circle. You can also play this game at snack time. The child holding the beanbag when the music stops gets to sit down and have a snack. Keep playing until all the children are sitting. Play "Get to Egypt" with Jumping Frogs Party Favors. Give each child a plastic frog and tell them that the other end of the room is Egypt. The first child to get their frog to the other end of the room by pressing down on the back of his frog to make it leap wins. Frog Bean Bag Set - Made of soft vinyl these bean bags are washable. Use these Jumping Frog Toy to play "Let Go to Egypt" to see which "frog" can reach the finish line first. 1. Before class prepare the paper plate frog craft (above). 2. Staple the sides of his mouth closed about two inches from the fold. Bend the mouth so that it stays open a little bit. Make cards with pictures of things frogs might eat such as flies, grasshoppers, and butterflies, and things a frog wouldn't eat such as cars, baseball bat, etc. Also make cards with the words of the Bible verse on them. 3. Fold up the pictures and place them in the frog's mouth. 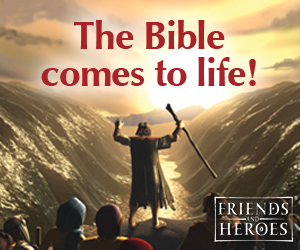 In class tell the children that Froggy wants to share the Bible verse with them. The only problem is he ate them and they will have to get it out of his mouth. 4. In class let the children take turns pulling a piece of paper out of his mouth, opening it up, and seeing if it is part of the Bible verse. When a child picks one of the words to the verse tape it up on the board. See if the children can figure out the correct order of the words. Before class cut out four lily pad shapes from green construction paper. Write one of the words from the Bible verse on each lily pad. "God will help you." Tape each lily pad to one of the walls of your room. 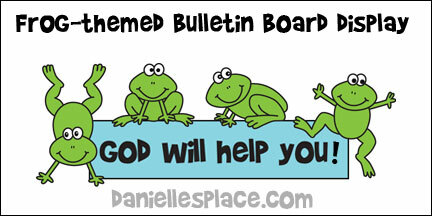 Print out some frogs from the Bulletin Board Display below and and write one word of the verse on each frog. Hide the frogs under the tables and chair in the classroom. In class go over the verse several times with the children. Split your children up into four different groups and place each group by a lily pad. (Tell your children to go and find a frog, look at the word on the back of frog, and then go and stand by the matching lily pad with their frog. When all the children have found the correct lily pad, tell them that when you point to them they should say the word on their lily pad and leap up into the air. Point to each lily pad in order of the verse so that the children say the words in order. Then have your children go and find another frog and start the game again. Keep playing until all the frogs are found. Before class place lily pads cut from construction paper on the floor in a circle. Make more lily pad than you have children so that the children are not jumping on top of each other while they play. Write, "Say the verse" on one of the lily pads. In class have your children jump from lily pad to lily pad as some music plays. When you stop the music the children should stop. The child standing on the lily pad that says, "Say the verse" should say the verse. Keep playing until the children get tired. Before class write one word of the Bible verse on four different lily pads cut from construction paper. Tape one lily pad to each wall in your room. Cut out frogs and write one word of the verse on each frog. 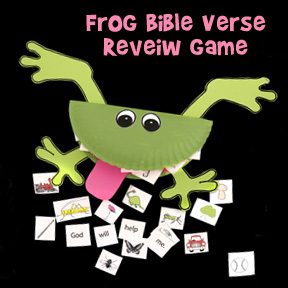 Make enough frogs so that each child in your class will have a complete Bible verse when you are finished. In class show the children the lily pads and tell them what they say. Tell the children that on the word go, they should each pick up one frog off the floor (from the lesson) and go to the wall with the lily pad that has the same word as the frog they picked up off the floor. When all the children have found the right wall, tell them that when you point to them they are to leap up into the air and say the word on their frogs. Start with the first word of the verse and go around the room. Once they get the idea, have them do it a little faster. "God will help you." You can also mix up the order so that the words say, "Will God help you?" Have the children answer "yes". Keep playing this game until all the frogs are off the floor. When they are finished tell the children to find four frogs with each to the four words so that they have a complete Bible verse to take home and study. 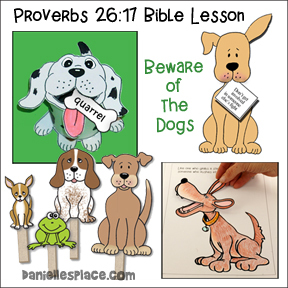 Have the children glue their frogs and some of the flies, grasshoppers, and gnats, and cotton balls from the lesson onto a piece of paper and then write the Bible verse on the bottom of the paper. 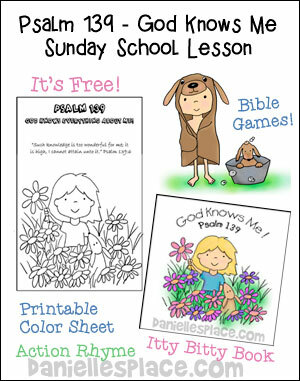 The children can take the paper home to study their verse. 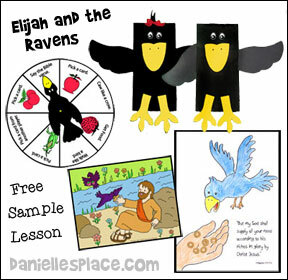 As an incentive you can tell them they will get a frog sticker next week if they can tell you the verse. The directions and patterns can be found on The Resource Room. 1. Paint a smooth rock and the back of the paper plate green and let it dry. When the paint is dry use markers or paint to add details. 4. Cut out feet shapes from craft foam or green cards stock as shown in the picture above (or use the pattern that is available to members). 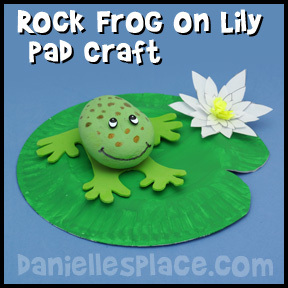 Glue the rock on top of the feet and then glue the frog on the paper plate. Use a black marker to draw in the mouth. 5. To make the lily flower cut four flower shapes from paper each one smaller than the next. To make the inside of the flower color a small rectangle shape yellow on both sides. Cut slits down the length of the rectangle about half way to the other side. Roll up the rectangle and glue it closed on the uncut side. When we did the plagues, I went to a party store and found two big rubber flies that I attached to fishing lines and dowel rods. My older youth flew them over our heads I also found plastic frogs that I put in plastic food storage containers, in a pot, a water jug, and under a pillow. I also found wind up grasshoppers that "hopped" around. I used a plastic goat and cow for the sick animals. I put red circle dots for the boils, I used brown rice that was dropped above their heads for the gnats, I made black masks for the darkness, used small marshmallows for the hail, red food coloring in water for the water into blood, and a stuffed lamb to explain Passover. I had a mother who made hail cookies, cow cookies, fly cookies, and frog cookies. Isn't God wonderful to provide those talented and willing mothers? I made a game board from foam sheets (you could use construction paper) and set it up in bowling pin pattern and numbered them 1-10. The children used a stuffed frog and told the plague associated with the number. 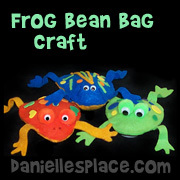 Frog Bean Bag Set - If you don't have time to make frog bean bags, you can buy them from Amazon.com. These bean bags are machine washable.